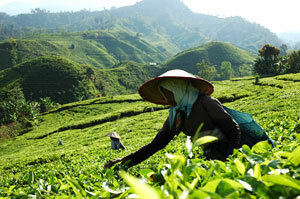 Andung Biru tea plantation is located in Probolinggo regency and become one of tourism objects of Probolinggo. This plantation area air is very fresh and cold. It also has natural plantation scenery that so impressions. The visitor can enjoy its tea aroma and the fresh air, because it stated in hill and beautiful scenery. Visitors will also meet with the tea farmer who busy to pluck the tea leaves. In this tourism object, the visitor also can watch and enjoy the special impression, processing of tea from the leaves taken to the tea ready to drink. This location is easy to reach by car or motorcycle.